Marcel Proust, In Search of Lost Time, Volume III-the Guermantes Way, Part II: Chapter One. A ladybug drinks from a water droplet on a ripe zucchini in my vegetable garden. I gently lift the garden helpmate on to another plant as I harvest the squash for dinner. Fog moves in from the ocean, flowing over the hills near our Laguna Niguel, California home. On that October afternoon, autumn light glows orange and yellow. They say Southern California has no seasons, but the feeling of a seasonal transition toward autumn is happening now. There is a distinct smell in the air and softer light in the sunset. Darkness comes more quickly. The sudden sound of a horrific crash and splintering glass thundered a few blocks way. Another accident on busy Crown Valley Parkway, where teen drivers race recklessly. Silence, then the sound of fire trucks and ambulances. Definitely an auto accident. Three hours later my wife Janice returns from work as nurse practitioner in the Emergency Room at Mission Hospital Laguna Beach. She confirmed that an accident claimed the life of another young driver. Probably driving too fast and hit a tree. I forgot about this until two days later. Driving down the hill on La Plata toward the intersection with Crown Valley, a surrealistic scene across the street caught my attention. I waited at the signal and could take in more detail. At least fifty high school age youth were gathered in a tight cluster, shocked faces, crying, two girls kneeling beside a large votive candle burning on the sidewalk. This is where the young man died. Here are his friends. The story appeared in the Los Angeles Times about the young driver, a senior at J. Serra Catholic High School in San Juan Capistrano. A brief description about the probable cause with most of the narrative a collage of remembrances from his classmates. The vigil continued. Many people have died on Crown Valley Parkway. Memorials of flowers mark the spot for a few days, and then are removed by CalTrans. This vigil was different. Every night, as I waited at the signal to turn on to La Plata and head home, I could see a new version of this tender vigil of love and friendship. Guitars and portable sound systems played his favorite music, clusters of candles and flowers remained on the sidewalk. Two young artists drew colorful messages with chalk on the sidewalk: to be seen from heaven? I wondered how long this unusual marathon of vigils would continue. Then one day Laguna Niguel maintenance trucks were there is full force with an Orange County Sheriff’s car. The sidewalk was blasted with high pressure hoses. Orange police caution tape cordononed off the area. Clearly the City of Laguna Niguel was saying: the vigil is over. But you can’t cordon off the human spirit. A few weeks went by. I would see one or two youth standing there, praying, singing, and crying. 1996 was a year of numerous street gang shootings in Santa Ana. My church is located in the historic Logan Barrio where many shootings took place. Frequently the victims were innocent bystanders. In front of St. Joseph’s Roman Catholic Church, two blocks away, the pastor, Father Christopher Smith, knelt at the curb holding the hand of a 16-year old altar boy who was shot and would die later that day. The place where he died was covered with flowers and mementoes. 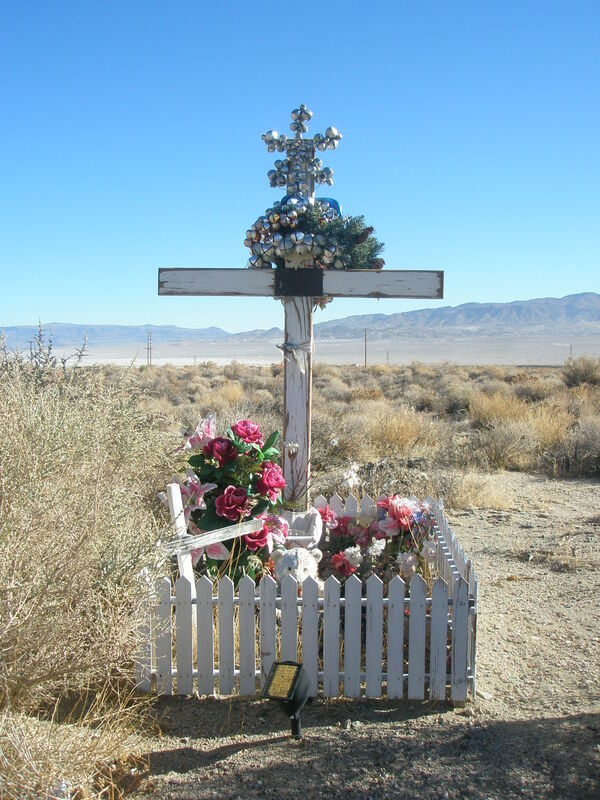 As you drive on Highway 395 between Adelanto or Mojave to the south and Bridgeport to the north, you will pass many roadside shrines to victims of auto accidents. These shrines will be clustered along the deadliest section of the highway, between Olancha and Adelanto. The most lethal highway section north of Adelanto is called “Blood Highway.” It has permanent bold double yellow lines with signs posted: no passing permitted. Nonetheless, I have seen a crazy, reckless driver in a large SUV pull out behind a line of slower cars and pass. I have seen near head on collisions, the car coming in opposite direction pulling to the side in a dangerous game of chicken. The Inyo Register, newspaper for the Owens Valley, describes every week a fatal or near fatal accident. There is a pattern. Usually the driver falls asleep, just for a few seconds. The car drifts to the right, the driver panics, pulling the car to the left; either the car flips over several times heading out into the desert, or drifts across the yellow line to hit another car head on. Taking rest breaks is vital to safe driving, but the skiers or others who are driving a long distance become naturally fatigued and terrible things can happen. There is a paradox here: driving through this spirit soaked landscape, the dramatic effects of volcanic eruption, earthquakes and glacial melting, inattentive to their power surroundings, fooling around with a CD player, texting, or on a cell phone, people die in horrific accidents. Your time here was not done. You were the one I would go and talk to. My heart aches because you’re not here. But at least you felt no pain. I know this is God’s plan. I know he took you home. Cold wind rustles papers and flowers. The cross bends in resistance, marking a deadly automobile accident several years ago. Recent offerings tell me that family and friends continue to visit. Why do they come here? Desert Dispatch, November 6, 2005, Barstow, CA. Kelly Moon’s daughter was killed in another auto accident on Mariposa Road, Hesperia. As any parent who has lost a child, Kelly thinks about her daughter every day. When the longing is especially hurtful, she doesn’t go to the cemetery. 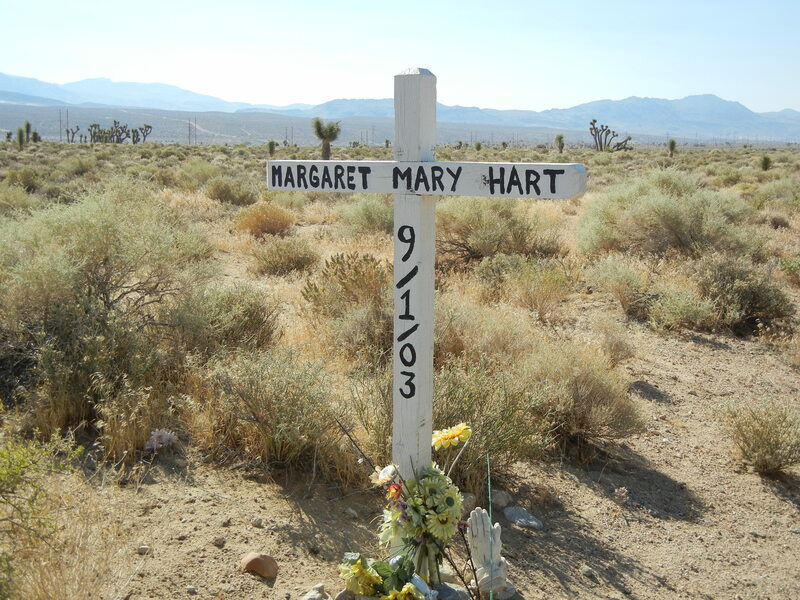 She feels closest to her daughter when she visits the faded white memorial on Mariposa Road. Traveling a little further north on 395, before Olancha, another roadside memorial appears and a highway sign marks this section of Highway 395 to honor CHP officer Paul Pino. He had stopped an 18-wheel commercial truck, was sitting in his car talking on the radio to dispatch, when another inattentive SUV driver rammed his patrol car into the truck, killing him. Marking that spot is another cross, candles, a teddy bear, three American flags and a police jacket. “Slow your life and your mind down. During the great migration of Conestoga wagons in the early 1850s, from St. Joseph, Missouri over the Sierra Nevada to Sacramento, thousands of pioneers pressed through vast prairies and endless, dry deserts possessed by dreams of gold. Accidents, disease and violence claimed the lives of many. They were buried right there on the California Trail. This also happened to cowboys moving vast herds of cattle north out of Texas on the Chisholm Trail. They also died and were buried on the road. When life became more established, cemeteries were created with memorials of carved angels and heartfelt inscriptions. When I go the Mountain View Cemetery, Altadena, CA, to visit the grave of my mother, it is very hard to locate her resting place. It takes me about twenty minutes looking for reference points, a wall, a pine tree, then walking down rows of marble plates imbedded in the grass, looking for my mother’s name. Then I can kneel, clear the crabgrass off the marker and the dirt out of the letters of her name. 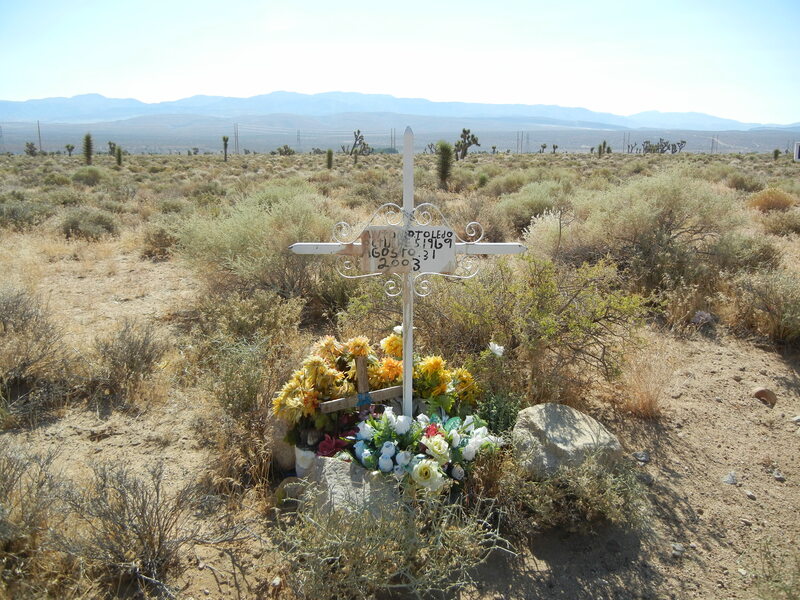 However the significant increase in roadside memorials, such as you will see on Highway 395, suggest our culture is going through an attitude change about remembering our dead. Today we want the personal and the particular. In the desert landscape this particular memorial, with its unique offerings of flowers and memorabilia, tell me that Paul Pino and Margaret Mary Heart were unique and special persons. These roadside memorials are not new phenomena. Centuries of history are behind them, especially in the Hispanic roots of California history. As the funeral procession moved from the church, after mass was celebrated for the deceased, persons carrying the coffin would stop to rest on the way to the graveyard. Each point of rest was a descanso. A small cross would be placed to mark the spot. As years past, those descansos could be decorated on holidays with flowers and other things to remember that person. Today that same spirituality continues with these roadside memorials. But they also say something to you as we press onward, with cruise control set at 80 mph. This is a dangerous place to drive. 1964 July 20 was another magnificent California beach day, as I drove north on Highway 101 with my girl friend for a day at Santa Barbara. The highway turned into a blind curve, the sudden sight of stopped cars caused me to brake quickly. The Chevrolet Tempest spun out of control into the center divider. Cars coming from the opposite direction hit me and spun the car around and around. I was not wearing a seatbelt. An ice chest in the back seat crashed forward hitting my head. Amazing I was not knocked out, but a large, bloody gash opened in my head. Amazing my girlfriend and I were not killed or seriously injured. Every time I drive north on Highway 101 and I pass the site of that accident, I see the old highway beside Emma Wood State Beach, below the new eight lane high speed freeway. I remember that day and the gift of life and years that followed. Southern California is said to be the most religiously diverse region in the world. While the various forms of Buddhism are dispersed throughout the East, all forms of Buddhism can be found here in California. Mosques, Jewish Temples, Sikh Temples are sandwiched between Christian churches and Hindu temples. Therefore I can imagine driving 395 in the future and seeing changes in roadside memorials, from wooden white crosses to a Star of David or the Crescent of Islam or a Buddhist Bodhisattva. All the religions of the world have their unique way of remembering the dead. There is a belief in the veneration of the dead that deceased family members continue to be connected to the living and can communicate blessings or warnings for the future. African immigrants to our country bring with them a belief in the ancestors. If family members are buried here, the family will continue to respect and honor them by leaving flowers, pouring an oblation of wine or whiskey on the ground, or leaving a food offering. Remembering the ancestor and attending to them, can bring blessings. Forgetting them can bring trouble like sickness. Asian immigrants to America see a core value in paying filial honor to their parents and other elders. Taoist traditions include burning paper facsimiles of things needed in the afterlife: houses, a Lexus, and an I Phone. The Other Side is a mirror image of this world, and they need food, clothing, shelter, and transportation. In the Asian communities of Orange County, Los Angeles County and San Francisco, street vendors sell these offerings that can be burned at home or in the temple and transferred to the beloved dead. I remember preparing for a funeral at Fairhaven Cemetery in Santa Ana, California. The family had not yet arrived. As I waited beside my car, dressed in priest’s cassock with holy water, I looked at the gravesite at the curb next to me. Right in front of me, on the green grass was a fresh dim sum bun, a Chinese language newspaper and a Starbuck’s specialty tea. All of this surrounded a grave plaque with words in Chinese. This family was expressing their devotion to a beloved patriarch. Vietnamese parishioners in my congregation tell me that before or after the Christian ritual of burial, a family will frequently do the old Taoist rituals, so that the soul would not become a hungry ghost. At the heart of the Christian tradition of remembering the dead is the Communion of Saints. I remember that my own mother Linnea Victoria Marguerita Karelius died on Easter Day morning, 1989. Through several months of dumb grief, I was unable to pray about this, until one night, in praying the Examen of Conscience, I began to imagine my mother in heaven, with Jesus and Mary and the saints. She had been sick and suffering for years. Now I could sense her prayers for me, on this side of life. Christians believe that this bond of Love is eternal. As Easter Day was Jesus’ conquest of the enemy Death, so we can live in hope, in an ongoing connection with those who have died and who now pray us through our daily lives. As we drive through the hauntingly beautiful landscape of the Owens Valley, there are special places, “thin places”, as the Celtic mystics would say, where connection and communion with the Holy is especially permeable. This blog is a guide to some of those places. I believe that these roadside memorials can be for you one of those places. In this vast expansive space there are places that have holy meaning. It begins with being watchful for these memorials, while driving carefully and responsibly. At the site you can look for a name and other signs of the life that are remembered here: a mother, a child, a family? In an instant, a life ended because of a traffic accident. You can sense a family’s longing to remember a beloved one. You can also gain a renewed sense of the gift of your own life, how we each go through each present moment living in Amazing Grace. How can I live most gratefully and responsibly with the ongoing gifts of this chain of present moments? Roadside Crosses: Personal Shrines in Public Places, MacKenzie Scott, Christian Century, July 12, 2011, pp. 11-12. New York Times, Ian Ubbina, February 6, 2006, “Roadside memorials”. Spaces for the Sacred: Place, Memory and Identity, Philip Sheldrake. Baltimore: The Johns Hopkins University Press, 2001. This entry was posted in Blog and tagged desert spirituality, grief, memorials, present moment. Bookmark the permalink. Brad, Thanks for sharing this blog. I’m always struck by roadside memorials and have thought about keeping a photojournal of them. Thank you so much for this article. My aunt is Margaret Mary Hart. She is in heaven with my Grandmother and most recently, my Mother. She has a HUGE family that misses her dearly. My wonderful cousin Danielle, wrote that honorable poem. We still have family in the Olancha area and we often visit Lone Pine where that is her final resting place. Many great memories and it’s a connection we feel to her when we see her memorial. She was an innocent victim of a head on collision. Her daughter and daughters friend survived after extensive care. Anyhoo, loved this and thanks!